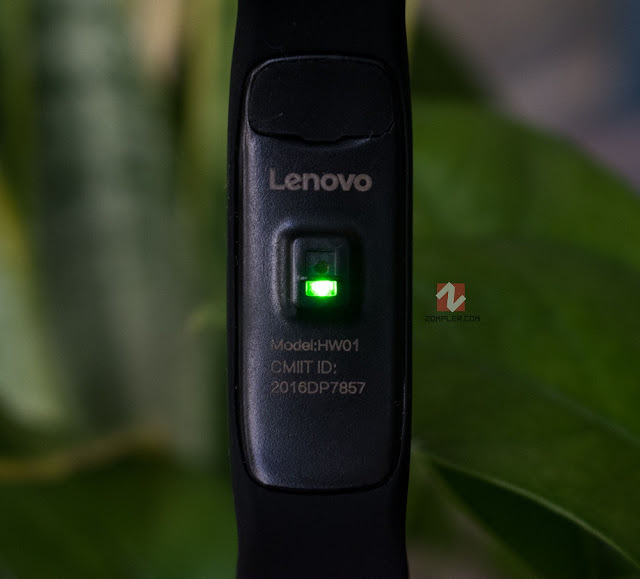 Today I have the newest Fitness band launch from a reputable brand that is the Lenovo HW01 fitness band with me for Review. HW01 sells at 30$, i.e. 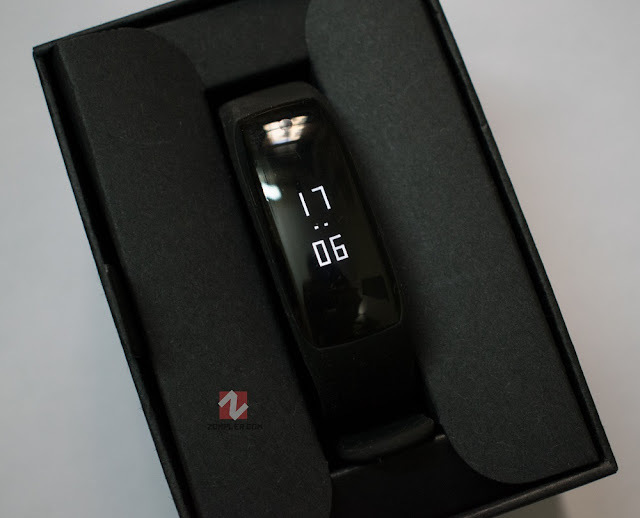 INR 1999 in India, so it directly competes with Mi Band 2, and it also boasts of the same features as the competitor, namely Steps tracking, Heart rate sensor, Sleep tracking, call notifications, silent alarms etc. This device doesn't offer anything in looks department which other Fitness trackers do not, its understated, doesn't jump at you if you saw anyone wearing this, only thing more noticeable than others according to me would be slightly larger OLED display and bulbous screen. The display is OLED here which allows 100% sunlight legibility. The clock display comes one when you lift up your hand in a swing motion as if to look at time on your watch. The top corner also has a capacitive tap key which you can touch to flick between different displays like steps, heart rate, calories burned etc. 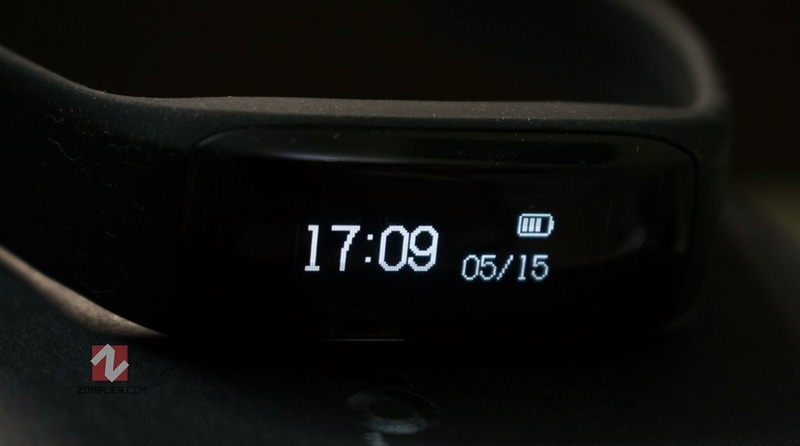 The back of the tracker features a prominent Lenovo logo with the heart rate optical sensor at center. 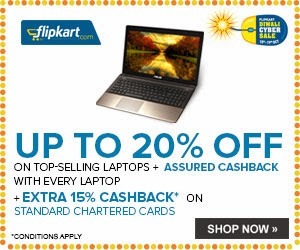 You also have a Micro-USB charging port at the back which is covered by a rubber stopper. Lenovo says this tracker is Splash and sweat proof, and it looks like so. It is not Waterproof, so do not take a bath with it or jump into pool with it. 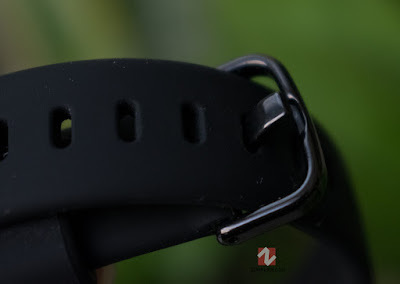 The Strap material is soft, very much softer than the Fitbit strap, and is more comfortable than Fitbit as a result, it is made of a good rubber which seems apparent and it seems like it won't break soon. Buckle is made of painted Aluminum. 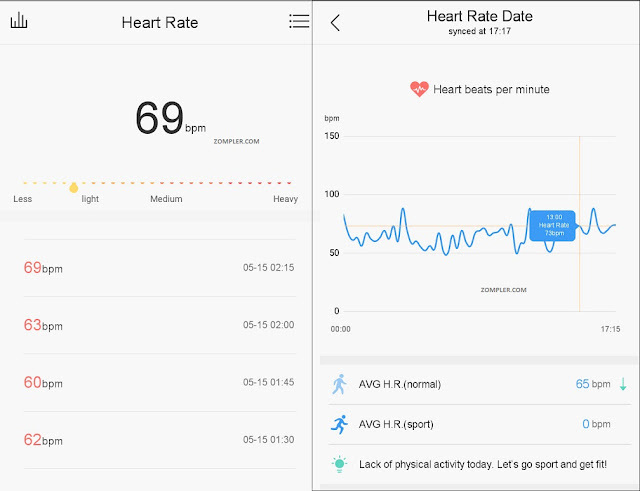 Like I said at the starting of this review, I am pitting the accuracy of this tracker vs the Fitbit Charge HR, so results are going to surprising to say the least, read on to find out why so. I used both on these trackers on the same hand for a full day to find out how close the Lenovo HW01 comes to one of the best selling fitness trackers on this planet. Steps Tracking : The steps I tracked on this sensor during the whole day were 1793, and on the fitbit, it was 1921 steps, that's a margin of about 7% which is very acceptable for a 30$ Fitness tracker. Calorific value is also calculated based on steps and the average Heart rate during your day so it was about the same. Distance : Distance tracked was slightly more off than number of steps which I guess is due to some setting about height or step size. Heart-rate Tracking : The average heart rate error on this device was about 1-2% compared to Fitbit charge HR, which was way more accurate than I was expecting since Mi Band 2 is inaccurate in that regard, the average heart rate during the whole day was 64bpm which was close to Fitbit since it recorded an average of 65bpm during the whole day. The App for this Fitness tracker is called Lenovo Smart Bracelet and you can download it from Play Store, or Apple app store free of cost. I am using this app on Android Lollipop and it runs and syncs without any issue, and has no trouble staying connected all the time. On being connected to Phone, you can control Music from your HW01 and you can also take selfies using a touch on the screen of your tracker. There is also a Phone finder feature on your tracker which allows you to find your phone, this makes your Phone beep quite loudly a few times and vibrate. The Heart-rate tracking screen has on-demand mesaure button and if you scroll below you can see the reading taken at an interval of 15 Minutes, on opening deatils you get a graph of your whol day heart rate variations and details. You can set the heart rate measurement to auto or manual in the settings here, you can also set a reminder where the tracker will vibrate if your heart rate gets above a point which you can set here. In the steps tracking screen you can see how much steps were under aerobic conditions and how much of those were under normal bodily conditions. Sleep tracking tab works almost the same way with a graph detailing how much of your sleep was Deep sleep/light sleep and how much times you were awake. In the settings tab you can activate Google fit support, which will share your fitness data with the Google fit app, which is very useful. On the tracker settings screen you can see the different options like - Control music, find phone, anti lost, sedentary reminder(which warns you when you stay sedentary for too long), set what hand you want to wear the tracker on, with final option being Find the band, which causes your HW01 to vibrate until you can find it. Notifications and Alerts : This is one area where this tracker loses out to Mi band 2, this tracker only supports call alerts, message alerts is patchy, there is no Whatsapp or other messenger support in the default app. The Battery on Lenovo HW01 is made to last about a week but it depends on how you use it, since I put it on auto measure heart rate, it lasts about 4 days to 5 days. 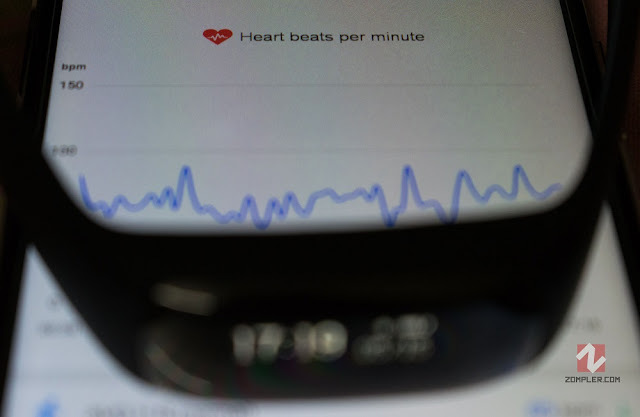 May last longer without auto heart rate measurement. Since the only competition for this tracker is Mi band 2, let's talk about them both, HW01 has a bigger OLED screen, more accurate steps and heart rate sensor, but on the other hand you lose many features like App notifications, since HW01 currently only has call notifications and SMS notifications, you won't get to see any other notifications like messenger or whatsapp in Mi band 2. At 30$ or Rs.1999, this is a competent tracker, more accurate than Mi band 2 in fitness tracking, but lacks smart features like extensive app notifications. If you are looking for solely an accurate Fitness smart tracker at budget Lenovo HW01 is the product to go for. If you are Looking to buy this Lenovo Fit band after this Review, you can do so below. If you will miss App notifications like Mi band 2, you can skip this, but who knows maybe Lenovo will add those features later, since Mi band 2 also natively didn't come with those features at launch. What exactly is not working can you tell in more detail ? Which sensor ? The Smart Band itself might be good in features but it is NOT supported by LENOVO. 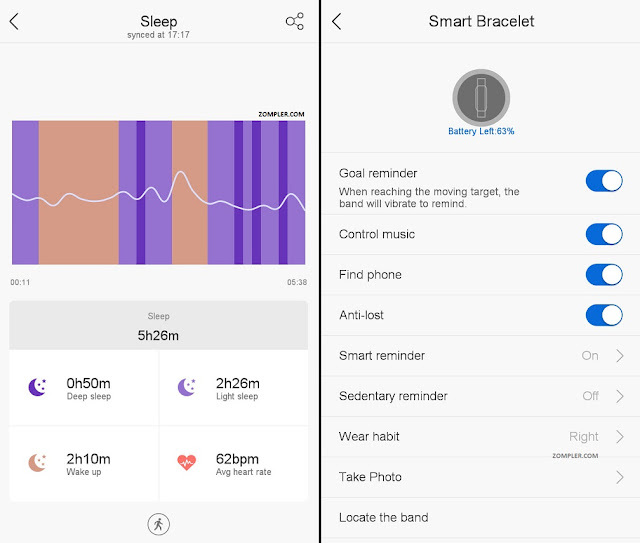 The APP which is to be installed in smart phone for syncing with the smart band is developed by a local Chinese developed Hong Jiang and not by Lenovo. I have returned the smart band and asked for a refund. Also the reported Features such as Music Controller and Selfie taking are not really there on this band, there is no option on the band or app for enabling these features. The above feature description is misleading.